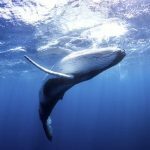 The whale-watch season has begun and to celebrate, Australian eco operator, Majestic Whale Encounters, is offering a discount of $700 per couple on its deluxe, nine-night, all-inclusive whale swim tour this September in Tonga, where the whales nurse their calves in the warm waters before returning south to Antarctica. 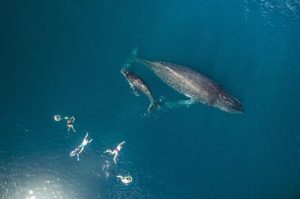 A record whale season is expected in Tonga this year, and the nine-night tour aims to make the most of this, incorporating stays and whale swims at two eco-resorts in Tonga, as well as kayaking, snorkeling, stand-up paddle boarding and a complimentary massage. After arriving in Tonga on September 4, 2017, guests will fly to Ha’apai Island, where breakfast, dinner and lunch are included for four nights as well activities such as kayaking, snorkeling on the reef just in front of the bungalows, stand up paddle boarding, bike riding and bushwalking. Three days will be spent here on the waters looking for and swimming with humpback whales. Guests will then spend the next four nights at the Fafa Island Resort, rated as one of the best eco-resorts in Tonga. The resort’s fales are built in traditional Tongan style with coconut thatched walls and wooden shingle roofs, and are just a few steps from deserted sandy beaches. Fafa Island is also renowned for its gourmet dishes, prepared using fresh products from the local market, and guests will enjoy meals served from an open-air bar and beachfront restaurant. One of the days at Fafa Island will be spent swimming with whales, while the other two will spent relaxing at leisure. 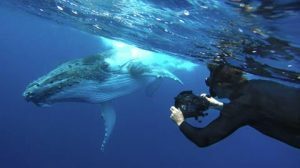 The package includes nine nights’ accommodation (including a night on arrival near Tonga’s international airport), local inter-island flights, all main meals, transfers and four memorable days of swimming with whales. Majestic Whale Encounters staff also remain with guests throughout the eight-day experience, assisting with the whale swims and sharing their knowledge of and love for the humpbacks. Including the $700 discount per couple, if booked by June 20, 2017, the deluxe whale swim package is available from $4625 per person, twin-share. Flights to Tonga from Australia (five hours direct) with Virgin Australia or via New Zealand are extra.